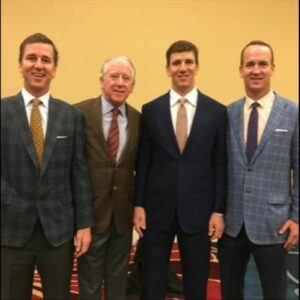 Archie Manning and his son, Cooper Manning, will take part in the North Mississippi Classic golf tournament, to be held April 16-22 at the Country Club of Oxford. The Ole Miss football legend and his son will host the Wednesday Pro-Am event on Wednesday, April 18, organizers said. The tournament is sponsored by Web.com Tour and is a PGA Tour-sanctioned event. A Manning Pro-Am pairings party will be held on Tuesday, April 17, in the Ole Miss football facilities. Archie and Cooper Manning will attend the pairings party, with Cooper set to compete in the Pro-Am and Archie serving as the official host. Following the completion of play on Wednesday, the Mannings will host an after-party at the Graduate Hotel in Oxford. The North Mississippi Classic will consist of 156 players chasing a $550,000 purse, with the winner receiving $99,000. This will be the third PGA Tour-sanctioned event to be held annually in Mississippi, joining the PGA Tour’s Sanderson Farms Championship in Jackson and the Rapiscan Systems Classic in Biloxi. Mississippi is one of only five states to host an annual tournament on all three tours, with California, Florida, Georgia and North Carolina rounding out the list. With 50 available PGA Tour cards for the following season (since 2013), the Web.com Tour is the path to the PGA Tour. Twenty-five Tour cards are reserved for the leading money winners at the end of the 23-event regular season. Another 25 are up for grabs at the four-event Web.com Tour Finals that follow the regular season in September.